of an old Juniper tree here at gemmashouse. Just a quick flutter up is the sweet nectar. Smart bird that one. Sweet little hummingbird....I like to sit and watch them flit from one place to another. They're so fast! I love the photo! We don't have hummingbirds much in the Netherlands, and certainly not in my backyard! I've always find the english name so much more beautiful then the Dutch name ('kolibrie') The haiku is lovely! That is a smart bird, and a great capture of its image. I wish I was so smart. Then again, I hang around the same old tree most of the time. Wonderful haiku and natural glimpse of life. Great catch, those little guys are illusive :) or at least pretty fast. Amazing that you caught him/her at rest! Most of the time I see hummers zooming so fast that they are but a blur! I love this little bird and his fidelity to this Juniper tree. Hummingbirds are the most beautiful creatures. We get them here around the morningglories and Fergus attempts to capture them all the time, but he is never successful. The are quicker than the eye or his paws could possibly be. Still it is a nice game for him and the birds don't seem to pay him any mind. Lovely haiku and photo. 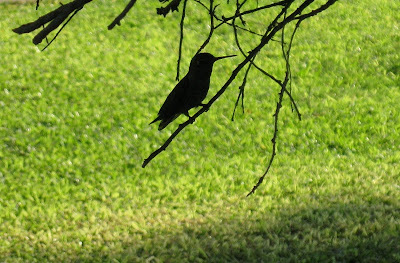 i love your hummer in the shadows. such perfect reminders to keep a playful heart and cultivate sweetness. which i always find here! We have the ruby throated hummers here too - they're incredible creatures! Great post! How I wish we knew our world as well as they know theirs.